254 pages | 38 B/W Illus. 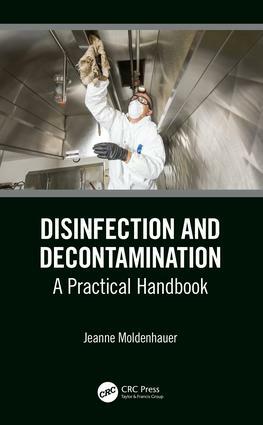 This book describes various methods of decontamination and how the methods work. There is a discussion of the various cleaning and disinfection methods utilized, along with details of how to qualify these methods. It also describes new technologies that may be useful in the battle for decontamination across industries. Finally, this book provides a single resource on how one can address contamination issues for a variety of manufacturing processes and industries. Jeanne Moldenhauer, Vice-President of Excellent Pharma Consulting, has more than 30 years’ experience in the pharmaceutical industry. She chaired the Environmental Monitoring/Microbiology Interest Group of PDA for more than 15 years, served on the Scientific Advisory Board of PDA for 20 years, founded the Rapid Microbiology User’s Group™, and is a member of ASQ and RAPS. She is the author/editor of many books, including Steam Sterilization: A Practitioner’s Guide, Laboratory Validation: A Practitioner’s Guide, Environmental Monitoring: A Comprehensive Handbook (Volumes 1-8), Contamination Control Volumes 1-4 (with Russ Madsen), System’s Based Inspections for Pharmaceutical Manufacturers, Preparing for an FDA Inspection: Review of Warning Letters (Sterile and Non-Sterile), and Biological Indicators, and numerous publications (book chapters and magazine articles).